I'm trying to edit a group members data but the save button is grayed out. We have come to the conclusion that the group was created wrong. 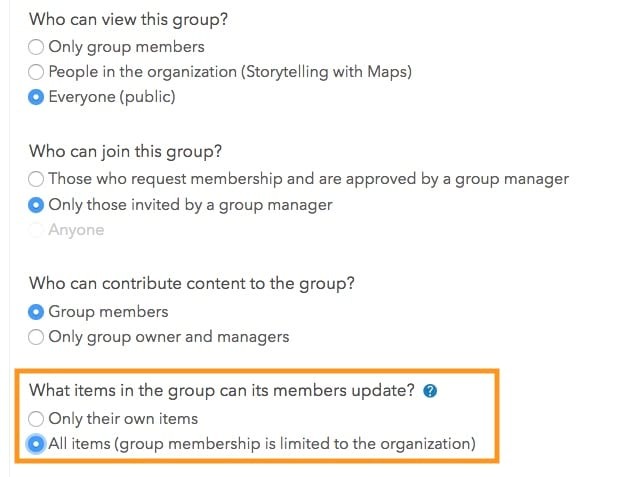 With that said Is it possible to change group settings so that group members can work together and edit each others data once a group has been created and not have to re-create a group and change the settings? If there is not an option is that something that could be added in? Hi, currently you are not able to change the group settings to allow all members to edit all content shared to the group. You will have to create a new group and enable the setting to allow members to edit all items. It is also tricky when you share items to the group, you will want to share from your My Content and choose 'Access and update capabilities' option. Do you want the users to be able to edit layers or update items like web maps and web apps? The update items capability is a potentially powerful setting that can override editing capabilities for all items in a group. For that reason, we don't allow this setting to be changed after the group is created. If you need to coordinate updating items, you will need to create a new group. If you are looking to just have users edit data through an application, try sharing an editable layer with a group without update capabilities. You will be able to collaborate on the data without needing to change the group settings. but I'm not having any luck getting this (the orange box below) to show. Creating a group with update capabilities will get you the functionality that you are looking for. As these groups have advanced editing capabilities, you require specific privileges to be able to create these types of groups. Additionally, you need to enable this capability when you create the group, it can't be enabled after the group has been created. I'd suggest creating a new group to see if the capability appears. If it doesn't, chat with your administrator about giving you this privilege. Thank you, I'll see what our administrator can do.